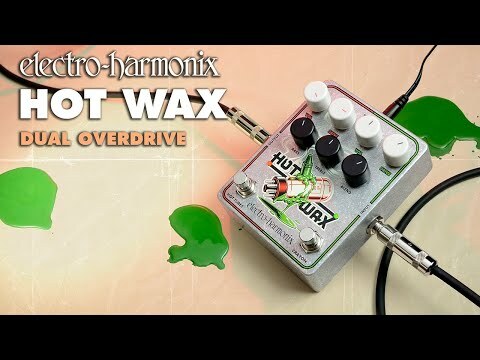 The Electro Harmonix Hot Wax Dual Overdrive Guitar Effects Pedal combines the Hot Tubes and Crayon pedals into one exceptionally versatile dual-overdrive pedal. Originally released back in the '70s, the Hot Tubes CMOS Overdrive replicated the captivating organic overdrive of a vintage tube amp. The Crayon is a more recent affair, which offers a full-sounding overdrive that pushes your tone a hard or a subtly as you want. Used individually or in a stack, you are guaranteed impressive results, every time. The Hot Tubes section responds to your picking attack and guitar volume level, kicking up a gear when you do, and taking it down a notch when you dial things back. The beauty of this arrangement is that your dynamic control can be executed perfectly, giving you a greater sense of "feel" during performances. Whether you're going all out or playing softly, the Hot Tubes knows exactly how to handle your tone with dutiful consideration. The Crayon likes to push your tone with a fuller response, driving all frequencies with greater intensity rather than focusing solely on the midrange. The warmth and richness grabs your attention immediately, accentuating your guitar's tone with a snappy attack - regardless of your picking attack or playing style. Using both circuits simultaneously results in far more aggressive edginess. You can either use the Crayon as the basic overdrive, then use the Hot Tubes to push the response even further. Alternatively, you could use the Hot Tubes as the rhythm tone, then kick in the Crayon to fill out the tonal range with a satisfying depth of flavour. The Hot Wax is equipped with a two-knob EQ (Bass and Treble) section, which enables you to craft and shape your tone with incredible dexterity, whilst an accompanying Blend control allows your dry and distorted signals to be mixed together at your discretion. The Electro Harmonix Hot Wax Dual Overdrive Guitar Effects Pedal isn't just for the guitarists. It is equally at home when it comes to handling bass, keyboard, and other musical instrument signals, making it exceedingly versatile.